Orangutans are native to only two countries in the world, Malaysia and Indonesia. In Indonesia and Malaysia it is against the law to keep orangutans as pets or in captivity. (Special exemptions are given to zoos and safari parks). Unfortunately, the ongoing massive deforestation in Indonesia, primarily due to the expansion of palm oil cultivation throughout the archipelago, is bringing orangutans to the brink of extinction. Not only are individual orangutans killed as agricultural pests but also local populations of wild orangutans are being extirpated as forests disappear leaving wildlife displaced and increasingly, in close proximity to humans. In 2013 Orangutan Foundation International translocated 7 wild orangutans to safety and rescued over 15 infants from captivity. All of the infants entered the rehabilitation program at the Orangutan Care Center and Quarantine and joined the 320 orphan orangutans already resident there. Orangutan infants enter captivity primarily when their mothers are killed in palm oil plantations. The infants, cute and appealing, are taken off their mothers bodies and sold as pets on the black market. This is highly illegal and not as common as it used to be but, unfortunately, still not unusual in Kalimantan. OFI Veterinarian Dr. Popo (on the left) and staff weigh translocated wild adult male orangutan. Orangutan rescues occur in a variety of ways. 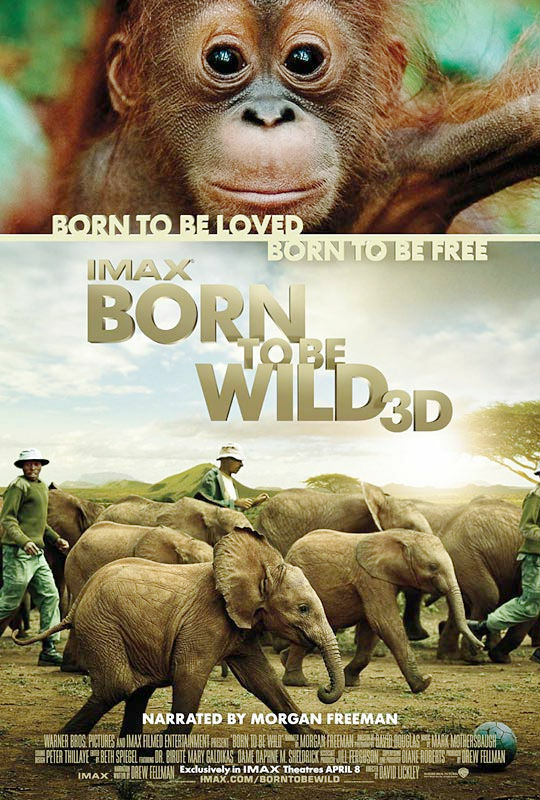 First, the PHKA (Nature Conservation and Forest Protection) branch of the Forestry Department confiscates captive orangutans from private owners. 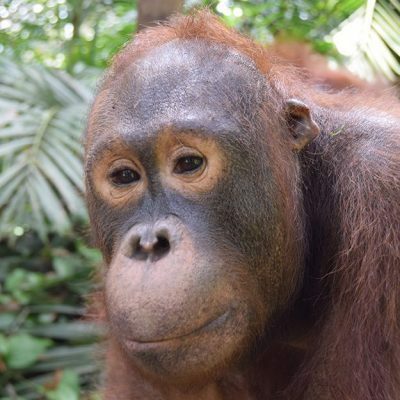 Second, local people, increasingly aware that it is illegal to own orangutans as pets, bring their orangutans to OCCQ in order to avoid run-ins with the law, especially after they are contacted by OFI directly. Occasionally, a woman (or her husband) will bring in a juvenile orangutan because it is too much trouble for the woman to take care of the orangutan pet now that he/she is no longer an infant. 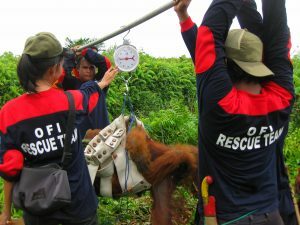 Finally, OFI works with local government officials, including the police, to confiscate orangutans directly from owners. This is always done as politely as possible with owners getting educational materials about orangutan and forest conservation from OFI. Government officials are usually reluctant to arrest owners if this is a first violation. Nonetheless, it is made clear to owners that it is illegal to keep orangutans as pets and owners are breaking the law. To avoid arrest, owners often have to sign documents pledging never to keep protected wildlife as pets ever again. Regardless, some owners still have to be threatened with arrest before they give up their orangutan pets. 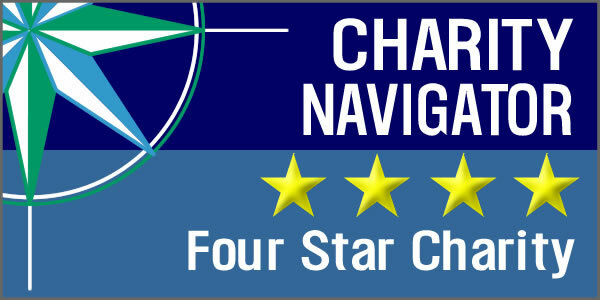 Once the process is complete, owners and their children receive an open-ended invitation to check in on their former pets in their new home at the OCCQ. Of the few that do, all are invariably satisfied that their former pets are better off at the OCCQ. Being kept as a pet, an orangutan’s chances of survival are slim. 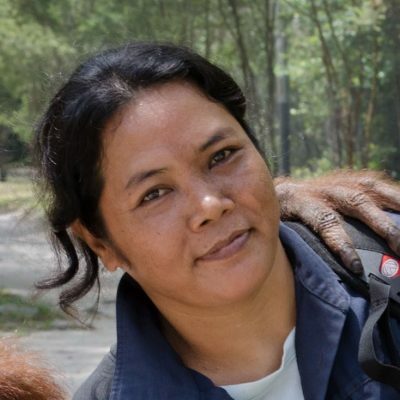 Out of the hundreds of pet orangutans OFI ever encountered in Kalimantan, there was only one who had survived into adulthood while in the care of his owners. He was a large adult male paralysed from the waist down.